What other medical conditions are associated with uveitis? How do health care professionals diagnose uveitis? What is the prognosis for uveitis? Is it possible to prevent uveitis? Uveitis is inflammation of the uvea of the eye. Three parts make up the uvea. The first part is the iris, which is the colored ring of tissue you can see in the mirror. The dark hole in the middle of the iris is the pupil. The second and third parts, which you cannot see directly when looking in a mirror, are the ciliary body and the choroid. They are located behind the iris. An ophthalmologist can visualize them using special examination equipment. Because all three parts of the uvea are connected, physician often refer to them as the uveal tract. Because there are three parts to the uveal tract, uveitis can be divided into different types, depending which parts are involved. Inflammation of the iris is iritis, or anterior uveitis. Inflammation of the ciliary body is intermediate uveitis or cyclitis. Inflammation of the choroid is choroiditis or posterior uveitis (or chorioretinitis if the retina is also involved). Anterior uveitis is the most common form. Inflammation of all three is called panuveitis. Sensitivity to light is the inability to tolerate light, medically known as photophobia. In someone who is light sensitive, any type of light source (sunlight, fluorescent light, incandescent light) can cause discomfort. Photophobia typically causes a need to squint or close the eyes, and headache, nausea, or other symptoms may be associated with photophobia. Symptoms may be worse with bright light. Light sensitivity is caused by a number of conditions that affect the eye (such as iritis, uveitis, and keratitis), as well as conditions that affect the entire body. There are many causes of uveitis, including autoimmune disorders (such as sarcoidosis, rheumatoid arthritis, systemic lupus erythematosus, Behcet's disease, Vogt-Koyanagi-Harada (VKH) disease, psoriatic arthritis, and ankylosing spondylitis), infections (such as syphilis and toxoplasmosis), and trauma. Additionally, some are idiopathic, meaning the cause is unknown. The eyes are often red and typically a deeper red than that seen in pinkeye (conjunctivitis). The redness is usually present in anterior uveitis. Aside from the redness of the eye(s), only an ophthalmologist or optometrist can see the other visible microscopic signs of uveitis using a slit lamp microscope. He or she can visualize inflammatory white blood cells in and around the uvea. Several diseases can be associated with uveitis: HLA-B27 arthropathies, sarcoidosis, lupus, rheumatoid arthritis, ankylosing spondylitis, ulcerative colitis, and multiple sclerosis, to name a few. Several infections in the body can also be associated: tuberculosis, Lyme disease, syphilis, herpes zoster (shingles), and others. Eye diseases that can cause iritis include Fuchs heterochromic iridocyclitis and UGH (uveitis-glaucoma-hyphema) syndrome. The classification of the different types of uveitis depend on which parts of the uvea are affected: iritis or anterior uveitis (iris), cyclitis or intermediate uveitis (ciliary body), choroiditis or posterior uveitis (choroid), or panuveitis (all three parts of the uvea). Different types are then further classified by cause: autoimmune diseases (when one's immune system is misdirected against one's own uveal tract tissue), infectious (when caused by a bacteria, virus, fungus, or parasite), traumatic (after trauma to either eye), or idiopathic (no identifiable cause). If your eye doctor suspects an associated medical disease, he or she (ophthalmologist) may ask you to see other doctors, as well. A primary care doctor or pediatrician will likely be involved in the work-up, and additional specialists such as a rheumatologist or infectious disease doctor may consult. An ophthalmologist will ask several questions about the symptoms, both in the eyes and the rest of the body. For example, the presence of painful joints, weight changes, skin rashes, fatigue, and other symptoms may help the doctor diagnose an underlying illness that may be associated with uveitis. The doctor will also need a detailed history of any eye health issues and medical conditions, as well as a family history of medical disorders. An ophthalmologist or optometrist will measure a patient's vision and eye pressures and carefully examine the eyes with the slit lamp. The dilated red blood vessels on the eyes' surface can have a characteristic appearance called a ciliary flush of deep red that is typical of uveitis (as opposed to the lighter reddish eyes of conjunctivitis). Though there are several types of uveitis, they all have one thing in common; white blood cells (immune cells of inflammation found in the bloodstream) leak from inside the blood vessels of the uvea to outside the blood vessels. These white cells permeate the uveal tissue and leak out of the uvea into the aqueous (liquid in the front part of the eye) and/or the vitreous (clear jelly-like material in the back part of the eye). This presence of white blood cells is what an ophthalmologist looks for when making the diagnosis of uveitis. Iritis (anterior uveitis) can appear initially as subclinical with no white blood cells visible. Other times, uveitis is not so subtle, with large numbers of cells visible in the aqueous and/or vitreous. In some cases, clusters of white blood cells accumulate on the back side of the cornea (the clear dome-shaped front cover of the eye). These clusters of cells are mutton fat deposits. In extreme cases, the cells can also form a large pool in the space between the iris and the cornea. This is a hypopyon. Cyclitis (intermediate uveitis affecting the ciliary body, or middle layer of the uveal tract) appears as white blood cells floating in the vitreous and collections of cells on the surface of uveal tissues behind the iris. Choroiditis appears as cells in the vitreous and uveal tissue but further posterior (toward the back of the eye). An ophthalmologist will need to dilate the patient's eyes and use special examination techniques to visualize this. Pictures of the back part of the eye using OCT, fluorescein angiography, or other technologies can also be helpful in assessing the extent of a posterior uveitis. Additional tests might include laboratory evaluation of a small sample of aqueous or vitreous liquid from the eye, blood tests, and/or X-rays. These tests take time. Therefore, a medical professional usually initiates a treatment plan based on a clinical judgment before the cause can be definitively identified. In noninfectious uveitis, treatment centers on control of the eye inflammation with anti-inflammatory medications. Often this can be achieved with steroids given as eyedrops, injection in or around the eye, orally (by mouth), or intravenously, depending on the extent and severity of the inflammation. The duration of the treatment may be as short as a week or several months or even years, depending on the cause. Usually, once the uveitis resolves, patients slowly taper the use of steroid eyedrops to prevent a rebound of inflammation. Steroid drops can also have side effects that your eye doctor must monitor closely. In chronic, relapsing or advanced non-infectious uveitis, medical professionals may prescribe steroid alternatives. In certain cases, health care providers may use immunomodulatory therapy (IMT) drugs such as methotrexate, azathioprine, and mycophenolate. Sometimes medical professionals prescribe biologic response modifier (BRM) drugs, including anti-TNF infliximab, adalimumab, and others. Close monitoring by a specialist (such as an internist or rheumatologist) is important to detect side effects of these medications If the cause is infectious, an anti-infective medication will also be used (for example antibiotic, antiviral, antiparasitic, or antifungal) to combat the underlying infectious agent. Eye care professionals may prescribe dilation eyedrops (called cycloplegics) in conjunction to uveitis treatment to help relieve some of the ache. They may also help prevent and/or treat scarring (synechial adhesions) of the iris. There are no known home remedies for uveitis. While waiting for the prescribed medications to take effect, wearing dark sunglasses can help with the light sensitivity. Some types of uveitis are more severe among smokers, so stopping (or at least cutting back as much as possible) is advisable. The prognosis varies tremendously; some types are mild and occur only once, never to recur. Others recur repeatedly over the years, coming and going at seemingly random and unpredictable intervals. Still other types never completely subside and linger for years, requiring chronic treatment to prevent flare-ups. Uveitis has many potentially serious complications that can lead to permanent, irreversible vision loss. For this reason, it is imperative that medical professionals treat uveitis promptly and to the best extent possible. If the inflammation continues unchecked, complications may include sudden or chronic rises in eye pressure that can lead to permanent damage of the optic nerves, resulting in irreversible vision loss (glaucoma). The inflammation can also damage delicate cells on the cornea and retina, causing fluid buildup that blurs and damages the vision, sometimes irreversibly. Inflammation of the choroid can lead to fluid leaking under the retina, causing a serous retinal detachment. Your doctor will check for the presence of synechiae, which are scar tissue (adhesions) that form between the inflamed iris and other parts of the eye (the front surface of the lens and/or the peripheral cornea). Synechiae can lead to glaucoma if they interfere with the normal flow of intraocular fluid. For these reasons, health care providers should treat uveitis as aggressively as possible. The medications used to treat uveitis have side effects of their own, some of them serious. The ophthalmologist, often together with the patient's other doctor(s), balances the risks and benefits of the drug(s) against the potential damage that can result from undertreated uveitis. It is not always possible to prevent uveitis, particularly since many cases do not have a known cause. However, one can reduce the chances of acquiring traumatic or infectious uveitis with common-sense precautions against risk factors. Examples include the use of eye protection when engaging in activities such as lawn edging and drilling, using extra caution around opening champagne bottles or firecrackers, keeping vaccinations up to date, practicing good hygiene and hand washing, guarding against sexually transmitted diseases, and getting regular general health checkups with a primary care doctor. Autoimmune diseases (in which the immune system attacks one's own body tissues) are often run in families (genetic), and perhaps gene therapies in the future will be available. 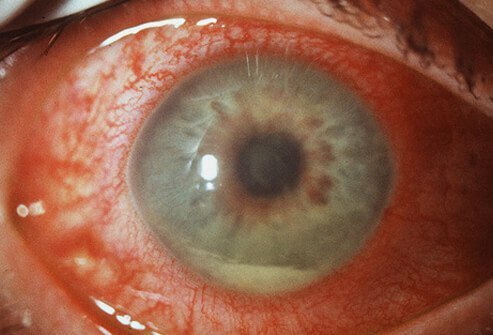 Prevention of flare-ups of uveitis requires close monitoring with repeat examinations by an ophthalmologist. Health care professionals must often adjust or modify the treatment according to both microscopic and clinical changes for optimal control. Durrani, K., et al. "Systemic therapy with conventional and novel immunomodulatory agents for ocular inflammatory disease." Survey of Ophthalmology 56.6 (2011): 474-510. Foster, C.S., et al. "The Ocular Immunology and Uveitis Foundation preferred practice patterns of uveitis management." Surv Ophthalmol 61.1 Jan.-Feb. 2016: 1-17. What are your symptoms of uveitis? Ankylosing spondylitis is a type of arthritis that causes chronic inflammation of the spine. The tendency to develop ankylosing spondylitis is genetically inherited. Treatment incorporates medications, physical therapy, and exercise. Multiple sclerosis or MS is an autoimmune disorder in which brain and spinal cord nerve cells become demyelinated. This damage results in symptoms that may include numbness, weakness, vertigo, paralysis, and involuntary muscle contractions. Different forms of MS can follow variable courses from relatively benign to life-threatening. MS is treated with disease-modifying therapies. Some MS symptoms can be treated with medications. other complications related to spread of the infection to the brain. Mycobacterium tuberculosis is the bacterium that causes tuberculosis (TB). Symptoms and signs of TB include bloody sputum, fever, cough, weight loss, and chest pain. Treatment depends upon the type of TB infection.